Part 1: North Valley Truck Transmission Center* "Bulletproofs" the GM/Allison 1000/2000 series Five-Speed Electronic Overdrive Transmission. 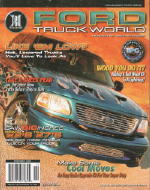 Part 2 Continued in February 2008 issue. 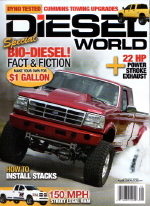 "We first noticed this huge F-250 Power Stroke because of the driveline. 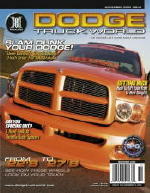 It's a massive rig, and a showy one at that, but the driveline is so amazingly stout we ran a feature article on the transmission alone in the last issue (See: DW March 07)...."
Up and coming West Coast Super Gas racer “Jimmy G” Galante strikes at the competition. 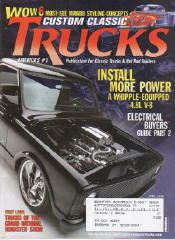 August 2004, Hot Rod Magazine. 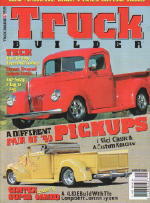 Cover Story "Return of the Striped Tomato"
August 2006, Truck Builder Magazine. Part V Backing Up Our Corvette ZR1 Engine with a "Race-Bred"GM 4L80E and a CompuShift Control System. The single most important component in any automatic transmission is the torque converter. 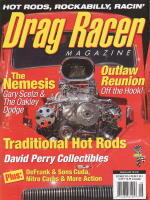 ...James 'Jimmy G' Galante says that a lot of problems are the result of too much heat. "What we're seeing, and what we're hearing as the biggest complaint is that the torque converter failed. Heat and torque converters go hand in hand- torque converters make heat: when they make heat, they stall. This is what happens with 700R4s with non-lockup torque converters." He illustrates this with and early- '70s El Camino, for example, that would have a 700R4, a smallblock with a '292' cam, a 3.73 gear, 28-inch tall rear tires which would require a 3,000 [rpm] stall converter. "A few months ago, the Project '72 El Camino went through a rear end makeover turning the existing 12-bolt single-legger with 2:79 gearing into a limited-slip posi with new 3:42 gears. Now most of you are probably wondering "why take nice highway cruising gears out and install lower gears"? Well my friends, my mind was already looking ahead the projects future. My thoughts were already leaning towards a 700R4 conversion, and the 3:42 gears were the right trick. Jimmy Galante over at G Racing and Performance Transmissions heard what I was looking into, and offered to build a street version of his race 700R4. After checking out all he does to his trannys, we asked him to go ahead with the build. Jimmy says, "What sets us apart from the others is, that we machine our pumps to GM specifications, and set them to within +/- .001 of an inch of their specs for gear clearance." The boost valve increases line pressure when the TV cable is pulled-thus so full throttle, full boost pressure. Most shops use the Corvette valve that measures .471 or the .500 aftermarket valve. Jimmy manufactures a .521 boost valve to make even more pressure. "I also use a Corvette 2-4 (2nd & 4th gear) servo assembly over a stock V-8 assembly" says Jimmy. "The Corvette servo has more surface apply area, so more holding power means more torque input capability." "G" also uses the Alto 3-4 (3rd & 4th gear) clutch power pack and the 2-4 power band. These items once again give more surface apply area for more holding power. The 3-4 power pack uses nine clutches instead of the six used in the stock 700Rs and the 2-4 power band is .500 wider than the stock band. Another item worth mentioning is all steel plates that are Kolene treated to add lubricity and hardness. "We also drill the valve body separator plate for more fluid flow in critical areas," says Jimmy. "Shift feel is important to the customer, so I block the two accumulators unless the customer wants a softer shift. 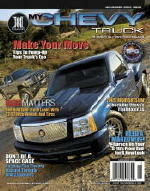 Blocking the accumulators gives the trans a good hard shift that most racing applications want." (We opted for the softer shift on the Elky, so Jimmy did not block off our project's accumulators. "The rest of the items we use are from the later model 700R4s," says Jimmy. "They have all the updates and better planetary assemblies we like to use in ours." For an additional charge, G Racing & Performance Transmissions will use a 5-pinion rear planet instead of the 4-pinion, and a different drive shell for higher performance or 4x4 transmissions."